Your search for the number one drone operator in Western Minnesota and Eastern South Dakota ends with Dragonfly View Drone Service. Expert knowledge, experience and superior equipment provided with true professionalism means accurate usable results, less hassle and greater overall value and return on your investment. Variable rate applications require data. The data we provide is accurate, relevant, easy to use and superior to satellite data. The value of using analytics tools that are available today is realized by providing information to agriculture professionals to leverage early-season data for replant decisions, allocate inputs to higher yielding areas, and apply chemicals more precisely. Providing crop analysis data offers agronomists, crop consultants, and growers expanded field insight. Our drones take high-resolution images, and then the system processes them. We deliver to you the results of that processing in the form of a color-coded map which can give you an exact location in a field of any weed pressure. The map layer and shapefiles identifying the areas with weeds can be imported into any other program that is already being used. These maps can be used to apply chemicals with precision. The population count per acre is helpful to take in-season action. After collecting the data, you will get a color-coded Plant Population Map. These results are delivered as a color-coded map in a format that is easy to use. This analysis gives you an accurate measurement of plants in a field shown as plants-per-acre (PPA). Topography and elevation data is valuable in helping to increase operating efficiencies when building variable rate prescriptions. Topography is also valuable for creating land-leveling or drainage plans such as sub-surface tile design and surface water management including ditching activities. 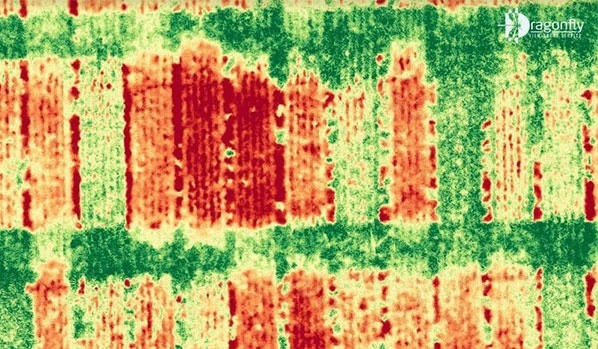 By identifying stressed areas, it is possible to compare plant health over time, allowing for easy and accurate identification of trouble locations. Beyond optimizing placement of any fertilizer or chemical needed, irrigation leaks and animal or insect damage can also be determined. Weeds can stunt sunflowers’ growth tremendously, especially early in the plant’s life cycle. Drone-based weed analyses let you see the precise size and location of weed-infested areas, which lets you improve pesticide and fungicide usage and avoid yield loss. Diseases and other types of stress like pest problems often lead to yield loss and unpleasant surprises at the end of the growing season. Stress reports (which show the size and exact location of problem areas) and disease analyses (which show the size and exact location of areas with a disease) are a great way to maintain the desired crop performance ratio. The most successful farmers are masters of determining the perfect harvesting date based on the plant’s growth stage. They know that if they harvest too early or too late, they will be losing profit. Drone-based flowering analyses are the perfect way to determine the best harvesting date since they’re both quick and more accurate than usual methods. Check out the professional drone services we offer at Dragonfly View Drone Service in Madison, MN. Our equipment and software are perfect for efficiently providing the aerial mapping, photography and inspection, services that you require. Whether you need to check for weeds or analyze flowering levels, Dragonfly View Drone Service can get the job done. Give us a call to learn about our reasonable drone service rates.